This degree gives you a deep and wide-ranging understanding of the history, politics and culture of the Middle East. From the early history of the Arabs and Islam to the complex international relations of today, you’ll build your knowledge of the religious, social, cultural and political life of a diverse and fascinating region. 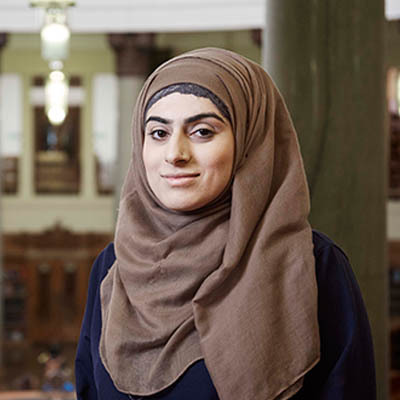 Core modules will build up your knowledge base on the key issues and themes in Middle Eastern studies, but you’ll choose from a range of optional modules to shape a programme that suits you. You can choose from a variety of topics, from Arab cinema to the Qur’an and Islamic legal theory. You don’t need to be able to speak Arabic, but you’re also welcome if you do – and throughout your degree, you can choose Arabic language modules to develop those skills. You can even try something different by learning Turkish or Persian. Whether you decide to do this or not, you’ll still develop a real insight into the context of communities across the Middle East. Our departmental archive contains 500 Arabic manuscripts, as well as 10,000 archaeological artefacts that ranging from Pharaonic to early Palestinian eras. It’s a fantastic research resource – as is the University Library, which has extensive collections relating to Middle Eastern and Islamic studies. The University Library runs free classes and workshops so you can learn how to use them. If you choose to study Arabic or another language during your degree, you’ll have access to the Language Zone with digital language labs, audio-visual booths and Computer Assisted Language Learning (CALL). There’s also our Electronic Resource Information Centre, which features specialised computing facilities for translation studies and Interpreter Training Suites to help you explore your career options. Core modules in your first year will give you a sense of the diverse politics, history and civilisations that have shaped the Middle East today. You’ll also begin to tailor your degree to your interests, with optional modules allowing you to explore areas such as the region’s media, Islamic theology or even new languages. The following year you’ll be able to build on this knowledge as you explore issues such as Zionism, the Arab-Israeli conflict and modern Middle Eastern society while choosing from a range of optional modules on topics from the Qur’an to Islamic legal theory. Throughout your studies, you’ll develop critical and research skills alongside your subject knowledge. In your final year you will continue to strengthen these across your module choices, but you will also put them into practice in your final year project – an independent piece of research on a topic of your own choosing. Your tutors are experts in their fields, and they share their knowledge through a number of different teaching and learning styles. Lectures, small-group seminars and tutorials are all important, while workshops may also be used in some modules. You’ll also spend more time studying independently, researching topics and reading widely to develop your critical and analytical skills. Support is always available, too – lecturers will even advise you on your choice of modules. Middle Eastern studies is a fascinating subject that will give you deep cultural awareness of a fascinating and complex part of the world. It will also equip you with a variety of transferable skills. You’ll have strong research skills, and you’ll be able to think critically about the information you find before drawing your own conclusions. You’ll also be able to communicate your views clearly and defend them in debate – all of which are skills in demand from employers. Graduates have gone into careers in the media, business and finance, administration, the civil service and government departments, think tanks, the charity sector and global organisations such as the United Nations, where an understanding of the region’s culture and politics is vital. Postgraduate study is an increasingly popular option too, either at Leeds or elsewhere.